The Black Acrylic is Used in Many Locations! Installation is easy with included wall anchors & screws! Black Acrylic Displayed with Standoffs! 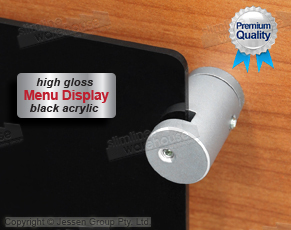 This black acrylic is a creative way to display a menu at cafes, bars, and restaurants. The black plexiglass board can also be used in retail stores and shops to announce new product lines, upcoming events, or sale specials. Black acrylic has a stylish look that allow it to be placed in any location! The menu board has an A1 (841 x 594mm) standard-sized piece of 3mm black acrylic to provide plenty of room for displaying messages. The black plexiglass board can be displayed in either landscape or portrait orientation, allowing your business to use it in the best manner at your location. This black acrylic can be used with liquid chalk markers. These pens write in vivid colour that are easily noticed and read by customers! 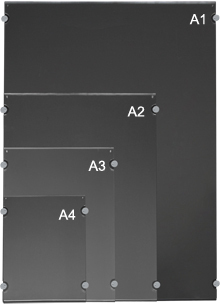 The black acrylic, like a menu display or black plexiglass board, uses edge-grip stand offs to hold the plexiglass in place. 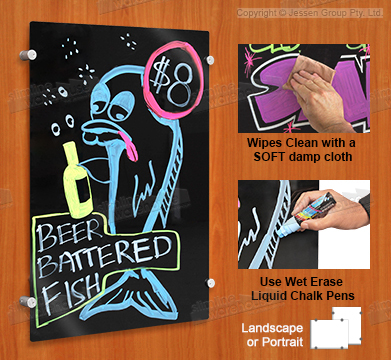 Messages can be changed and removed easily by using a soft damp cloth and carefully wiping the liquid chalk message, it may take 1 or 2 goes over the board to remove all marks, we strongly suggest to wet the soft cloth to avoid scratching the acrylic display panel. 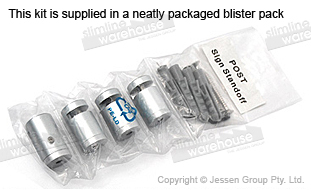 These aluminium stand offs are tightened using the included allen wrench to secure the board to the wall. Installation hardware is included with each purchase. The wall anchors and screws will allow for installation into most wall surface types, though you should check with a professional if you are unsure. The stand offs have a matte silver finish to easily fit in with any location! These plexiglass board displays are used in different areas as a menu board, display sign & eye-catching way to display information to passersby. Different sizes are available to choose from, allowing your business to find one that will work properly with your needs. 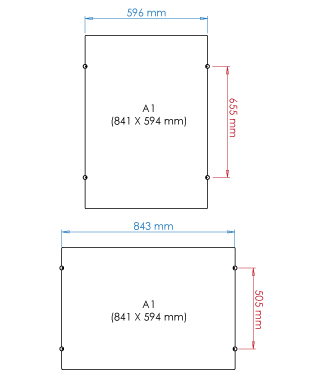 The plexiglass board display is A1 (841 x 594mm) standard sized, and is held in place securely with edge grip standoffs. Write using chalk markers to create an eye-catching display for placement in different shops! This frame can be displayed in portrait or landscape format! Through the main shopping page you can find hundreds of different products that will benefit your business. From clip frames, whiteboards, pull up banners, & light boxes to cafe banners, stand offs, lecterns, & TV stands, we have plenty of options for you to outfit your company. Purchase today! Slimline Warehouse has been providing high-quality products at low prices for many years, creating a wide customer base that come back for our constantly updated selections. We provide same day despatch on most in stock items if purchased by 1pm EST. Our warehouse ships to Adelaide, Brisbane, Perth, Sydney, Melbourne, & everywhere else in Australia!